We knew Pizza Hut was gearing up for greatness when we spied some of the trademarks they'd scored. But it turns out the "Old-Fashioned Meatbrawl" was just the beginning. The Hut is actually releasing a massive menu full of new sauces, crusts, and pies that they're billing as the biggest brand evolution in company history -- and that's coming your way in just nine days. 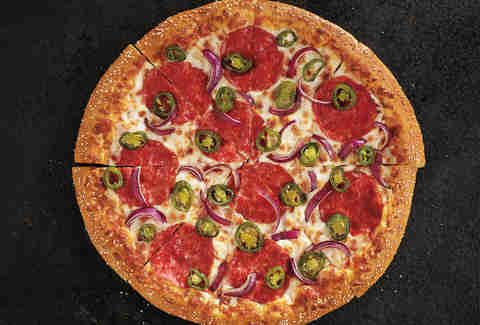 Pizza Hut is also jumping on the chaos Little Caesars started with a Salted Pretzel crust. It'll headline two of the new pizzas: Pretzel Piggy is a pretzel pie with the also-new Garlic Parmesan sauce, smoked bacon, mushrooms, and spinach with a balsamic sauce drizzle, while Hot & Twisted (seen here) pairs its pretzel crust with crushed tomato sauce, salami, sliced jalapeño peppers, and red onions. Other pie options include the BBQ Bacon Cheeseburger, 7-Alarm Fire, Cherry Pepper Bombshell, Buffalo State of Mind, and that Old-Fashioned Meatbrawl. But if you're just looking to mix up your usual order of half-cheese and half-pepperoni, the new toppings are pretty great, too. Under the Flavor of Now regime, you can now add sliced banana peppers, Peruvian cherry peppers, fresh spinach, premium salami, and meatballs to your pizza. 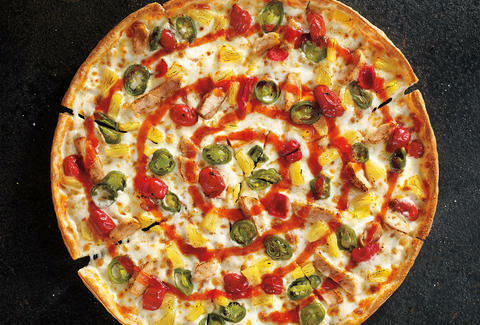 Pair that last option with the Sriracha drizzle and you have "spicy meatball" jokes (and probably heartburn) for days. But the food's not the only thing changing. In the spirit of this sweeping new menu, the Hut is dropping a revamped online ordering system and new branding on boxes, cups, and uniforms. It's a lot of change all at once, but we're pretty stoked to infuse our Stuffed Crusts with hot sauce. Now, where's our taco pizza? Kristin Hunt is a Food/Drink staff writer for Thrillist, and generally supports pretzel-crust pizzas and all they stand for. Follow her at @kristin_hunt.